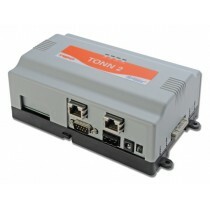 The Trend Open Network Node (TONN) is a Trend network device that enables the Trend system to interf.. Replacement battery pack with mounting frame for TONN2, TONN6, TONN6E Spare parts overview (English..
Battery-less TONN 3E with 24MB of Java heap memory and Trend Lite driver. This is limited to 200_x000D_points each for each driver (EIB/KNX = 500 points) with total resource count of 500kRU_x000D_ max.